Eight colorful fish swim up, down, and around a stream, wiggling from side to side and opening and closing their mouths. Kids take turns picking cards and using their different-colored fishing poles to hook and catch the fish pictured on the card that they've chosen. The first player to catch three, wins. 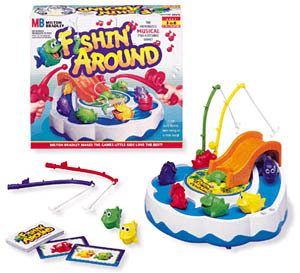 Two to four preschoolers through first graders can play this motorized musical fish-catching game without knowing how to read.